They have 4 sons, my hubby being the youngest. So for the inside of the card I used some pp's to create 4 framed blocks, 1 for each of their sons to write a message from their respective families. I really hope they like this and I thought it would be something more personal to keep than some store-bought card. I really do like this. I know they will love it. 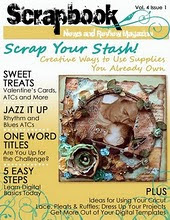 The journaling blocks are a wonderful idea! I luv it! A beautiful card and tribute. You're a great DIL. Oh this is the perfect gift by far!!! It's so personal and heartfelt - better than any store bought card could be! Wow 50 years together !! congratulations to them Wendy! love this card!! very precious!! they will love it!!! very nice. sent you a blog award. you can see it on my blog. Congrats to them! 50 years is awesome... my Grandparents hit that a few years back and we had a huge celebration for them. It is awesome to see. Beautiful layout.....but 50 years??? When did they marry, at 10 years old.....they look great.....happiness must be an age preserver...lol!! !